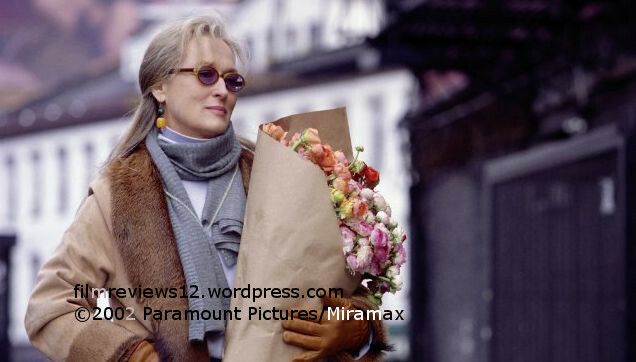 The Hours tells the story of how the Virginia Woolf novel Mrs Dalloway affected three women throughout history. They are 1) Woolf herself, 2) a housewife in 1951 Los Angeles, and 3) a modern woman in 21st century New York. This is a powerful, powerful film. This is not a movie to be simply glanced at. It envelops you, and you hit every emotional string with it, with clarity and fullness, the likes of which you haven’t recently seen. If you do choose to watch it, and I highly recommend you do, just know what you’re getting yourself into. Virginia Woolf is played by Nicole Kidman, set in 1923, in Richmond, outside London. She begins to pen the words of Mrs Dalloway one day. This story is given the least amount of screentime. In 1951, Laura Brown (JULIANNE MOORE) is a housewife, who, on her husband’s (JOHN C. REILLY) birthday, she and her young son (JACK ROVELLO) prepare a cake. Or at least, under the guise of doing so. She’s been depressed lately, and at one point or another, has contemplated suicide. In 2001, Clarissa (MERYL STREEP) lives in New York, and is busy planning a party for her friend and ex, Richard (ED HARRIS), who has AIDS. Richard, a writer, has recently won an award, but is convinced that he’s just won the award due to his terminal illness. Clarissa now lives with her partner Sally (ALLISON JANNEY), and meets Louis (JEFF DANIELS) who dated Richard years back and has flown into the city from California for the party. Superb acting is to be expected, and that is received. We have Julianne Moore, Meryl Streep, and Nicole Kidman in the lead roles. Acting is only as good as the screenplay will allow, and that is very good too. Based on the novel by David Cunningham, David Hare creates a script with such simplicity on the surface, but loaded with complexity if you dare to look in to it and examine what it does. The score by Philip Glass appeared to be aiming for a clean, no hidden agenda score, but it relies on the same few notes repeatedly – this can prove to be more or less monotonous instead of haunting and beautiful, as the film it accompanies happens to be. But the pacing can indeed drag a little. Not absurdly, but at times this movie does feel like it’s on the longer side. Still, at 114 minutes, there isn’t really any obvious padding. 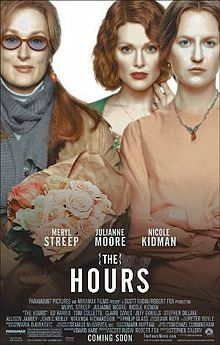 The Hours is unquestionably a depressing film, but its raw feeling doesn’t make it a negative experience. Some say they only wish to go to the movies to be happy, but I argue that if any film can present a fictional world with characters, and make us care for them personally, and what happens during the limited time we are granted with the story, that, I will say, is a good movie. Since The Hours does exactly this, it is a good movie. I enjoy a summer blockbuster, but to see what is often the other end of the movie spectrum, a character driven story that makes you think, can definitely be a powerful and incredible event. If you aren’t braced, The Hours will drain you, but if you know what to expect, or you think you know, this is a moving, transcendental experience.